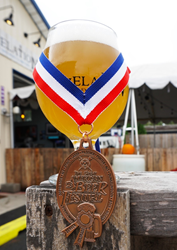 Revelation Craft Brewing Company received a bronze medal at the 2017 Great American Beer Festival (GABF) competition. Presented by the Brewers Association, GABF is the largest commercial beer competition in the world and recognizes the most outstanding beers produced in the United States. The top three winners in the competition’s 98 beer-style categories were announced October 7 at the Great American Beer Festival awards ceremony held at the Colorado Convention Center in Denver, Colorado. “Humbled to be recognized for our beer. Like so many other great breweries, our team works hard to deliver delicious brews to our customers and we never stop learning or improving. We are grateful for the support as we pursue our passion at Revelation!” said Patrick Staggs, Brewmaster, President, and COO at Revelation Craft Brewing Company. Revelation Craft Brewing Company was recognized in the Gluten Free beer-style category for its Co- Conspirator Apricot Sour. Originally their collaboration beer with Ghostfish Brewing Company, Co-Conspirator Apricot Sour is brewed with buckwheat, millet, biscuit rice, and flaked quinoa making it 100% gluten free. The addition of coconut water lacto and fresh apricot purée ensures the beer is also 100% delicious. Revelation Craft Brewing Company is a 4-barrel microbrewery located in Rehoboth Beach, DE that specializes in the exploration of various beer styles, while continually working to perfect the beers that they have brewed in the past. Located right off a bike trail, the brewery has become the perfect location for bicyclists to start, end, or just a take a break from their ride with 1 of the 15 rotating beers on tap to choose from.